Julian Barney Interviewed Margery Good The Morning Of The Final Day Of Crufts 2009. Although The Adrenalin Must Have Been At A High, With Margery, Waiting Nervously For The Final Line Up Some Hours Later; Julian Had An Enlightening Conversation With Her. I managed to spend an hour with Margery Good joint owner and handler of Am/Can Ch Efbe’s Hidalgo At Goodspice on the Sunday morning of Crufts BIS, talking about all sorts of things from the feeling of getting ready for BIS to the how she got into dogs in the USA. So what was the starting point? I owned a Kerry Blue Terrier as a 10 year old and this really stirred my interest in dogs. I started to take it to Obedience classes and got really involved, and from there I started to talk with the instructors. Then in 1964 I got my first German Shepherd Dog and took her along to Obedience classes and with the instructors I was introduced to my first dog shows. I would travel with them to local shows and from that point on I always knew I wanted to show dogs. And I knew that I had to do it and to the very best of my capability. I made a very conscious effect to make sure I got as broad a grounding that I could possibly get. I would work in kennels and with horses during the holidays. I spent some time working on a ranch in Indiana during my summer breaks from college. I also worked for the great George Ward and Dennis Kniola a professional handler in the US for a summer and I really felt I got such a good understanding of construction of animal. I then and went and visited the kennel of the late Olive Surgen at 15 years old where she had 2 Sealyhams and I fell in love with them straight away. I decided I would have one then. The first one I had that I took to Montgomery won the winners class. And that was it. So what would your greatest moment be to date? 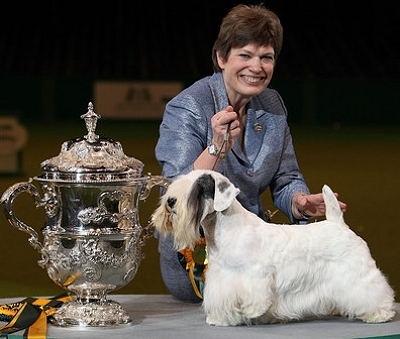 As a true terrier person it would have to be winning BIS at Montgomery County Kennel Club in 2008, and then I would say winning the Eukanuba National Dog Show BIS in 2007 under Maxine Beam who have really admired as a judge for many years. Then it would have to be BIS at the World show in Stockholm last year. I’ve got to ask how did you get the name Charmin as it sounds if it could be a Native American Name? Well one of my assistants called him “Spot on the Ear” for a while and then one day his co-owner at the time Judy Carter who had Parson Russell’s picked him up as a puppy and described him as “white and soft” compared to the really harsh coats of the Parsons puppies. So yes he’s named after the Toilet paper – no more said. As I’ve said I worked with horses and have had an interest in them ever since. So working on a ranch you hear of horses and there was a legend of a horse called Hidalgo he was a famous American endurance mustang that took part in the “Ocean of Fire” survival race across 3000 miles of Arabian Desert in 1897. He was owned by Frank T Hopkins who was a cowboy and dispatch rider for the U.S. government. He carried a message to the U.S. 7th Cavalry Regiment, authorising what became known as the Wounded Knee Massacre. While working as a stunt rider in Buffalo Bill's Wild West shows, Hopkins was advertised as the greatest rider the West had ever known and so the Sheikh puts this claim to the test. Also interestingly enough Hidalgo means in Spanish “of nobility”. So not a bad choice of name in the end! Even though Charmin was bred by France Bergron she is based on your lines? Yes as I mentioned before I’ve always had a love for Sealyham and have breeding them for many years with the support of my family. My mother has always been a great help to me and came to many shows with me over the years offering support and love when needed. I bred Charmin’s sire and if you look at his pedigree you will see many of my kennels dogs are behind him on both sides. Tell me a little about Charmin? In his first 2 weekends of showing he got 13 points at only 6 months and won his Canadian Champions title and he was BP at the Garden State all Terriers Club. So we knew we had someone special. He has always had such great presentence even from an early age, a real adult! And what a great personality in the ring! So what next for Charmin? We’ll see after today but the intention is to get 6 more BIS and retire him then. That will take him into a very elite club of a 100 BIS wins all breeds and that would be a fitting end to a great career. Then he will live with me for the rest of his days. What have been the highlights of your Handling Career? I met Patricia D Peters some years ago and showed Kelso Point of Vue who I won BIS in 1987 at Montgomery. The dog was seen by many in the US as the embodiment of a Lakeland at the time. I’ve shown many dogs in many different groups but my real passion would always be for Terriers. I’ve bred Airedales, Kerry Blues and Lakelands and of course my first love Sealyhams. How do you feel the dog scene has changed since you started all those years ago? I see a lot of new handlers coming on to the scene that have not been as lucky as myself to have done the apprenticeship that we had to do, and so they just don’t have the foundations and the deep knowledge of dogs and construction and how everything should go together. There is no doubt there are some very talented handlers that have come along more recently who are very able. Since returning to the States Margery Good and Sandra Middlebrooks have decided to retire Charmin on a high and not go for the 100 club. A fitting end to a wonderful career!